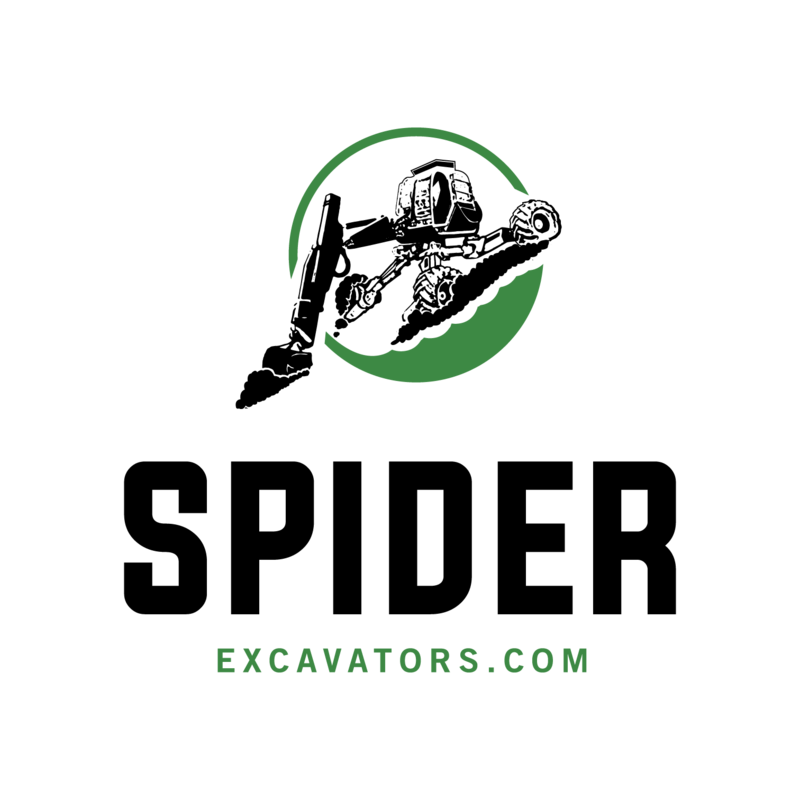 Spider Excavators | For All Your Excavators Need. Using a Menzi Muck Spider. The Menzi is a walking excavator. One of its best attributes is that it can comfortably operate on steep hills of more than 45 degrees. Our spider is designed to provide the least possible impact on the ecosystem while delivering the superior outcomes. 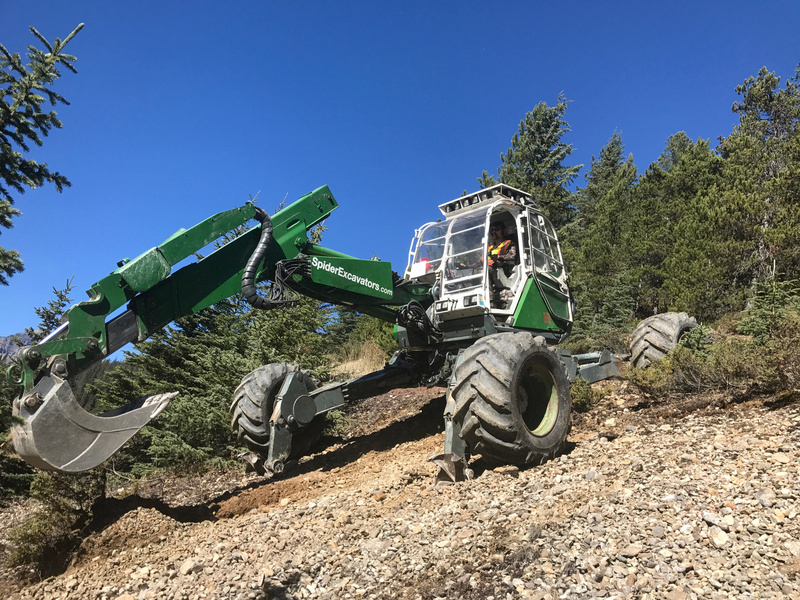 On steep inclines, the rear legs hydraulically extend the stabilizing claws to anchor the machine in place providing a safe level platform to work from. If connected to a winch, the Menzi can work on even steeper slopes. 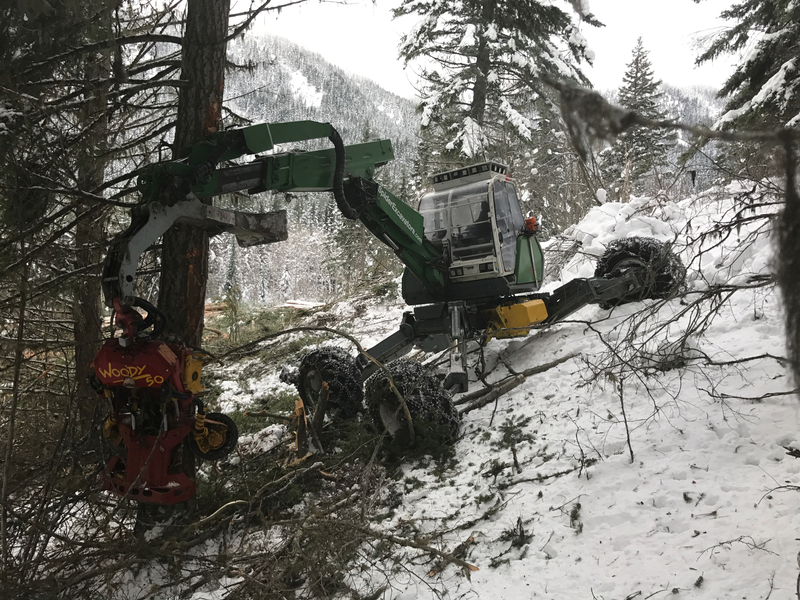 Attachments like the Mulcher, Dangle head (felling/processor), Winch, Grading and Digging buckets plus four equally sized wheels and stabilizers ensure that the Spider can be used in any situation. 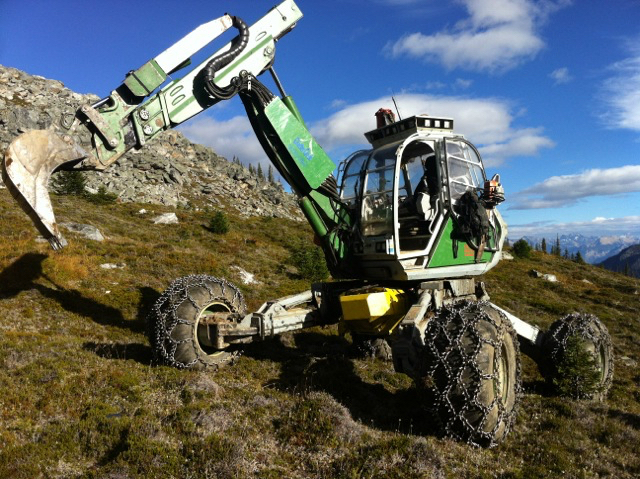 There are a few other spider excavators in BC but none with the 4×4 system and this impressive list of attachments. The machine is road legal. Four equally sized rubber tires enable it to drive at a maximum speed of 10km/hr. on smooth surfaces. Off-road, it can work on slopes exceeding 100%. The four large tires give it an incredibly light footprint. Conventional excavators adapt the terrain to level the machine. This machine adapts its chassis to match the terrain. This eliminates the need for roadbuilding to access work sites. In rocky conditions or bedrock, the rubber tires excel, far beyond the capabilities of tracked excavators. 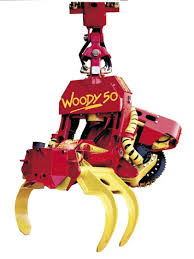 The Woody 50 is a dangle head processor that fells trees up 24’’ in diameter, stripes branches, and cuts trees to length. When felling trees, “positive control” is achieved with this head. Even trees that lean towards assets can be safely felled in the desired direction. The grapple can handle wood over 36’’ in diameter thanks to the extra wide opening of the grapple. This head is unique in the industry because the processor end folds up and out of the way when not needed. This allows for efficient grapple operations when “hoe chucking” and even loading trucks. Also, the head excels at building brush piles. The design of the grapple limits soil contaminating the pile. The ability to buck the material into short lengths builds tall, clean, tidy burning piles. The head can be “stowed” completely, grabbing the working foot. 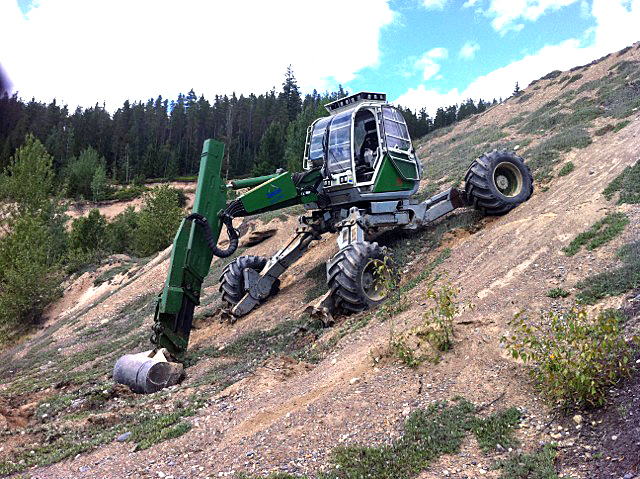 With the head secured, the working foot is used to push, pull and lift the machine in extreme terrain. No other dangle head processor on any machine achieves this level of mobility and diversity of applications. This attachment can mulch or chip trees and brush up to 12” in diameter. This is a very powerful tool that can clear large areas of brush and trees in a single shift. Two types of teeth allow for very efficient cutting and chipping or actually tilling the chipped material into the soil. The drum Mulcher differs from rotary munchers in that the drum Mulcher allows for control over the “wash” of wood debris coming from the head. With this control, work close to traffic on highways and other structures and assets is possible. This winch allows for both the securing of the machine and yarding of logs and other materials. 100m of 14mm cable makes for maximum flexibility of anchor locations and long distance yarding. 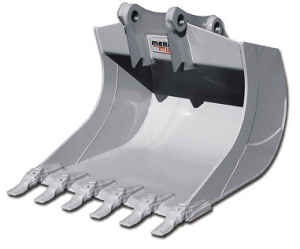 This bucket can be used for grading, loading and all manner of soft material excavating. 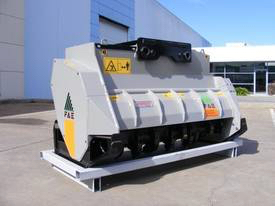 Although a rigid system, the chassis can be manipulated to achieve the same results as a hydraulic tilting system when fine grading is required. 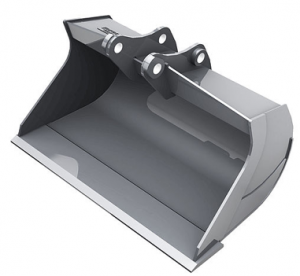 This bucket is used for ditching, hard material excavating and trenching. The ability of the chassis to manipulate gives the performance of a toothed digging bucket and the fine grading of a hydraulic tilting system. The large, low-impact tires are an asset in sensitive ground conditions. The machine can do circles on your lawn without significant damage. 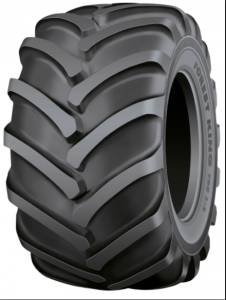 The large rubber tires are at home on pavement, grass, boulders and bedrock and forestry settings. 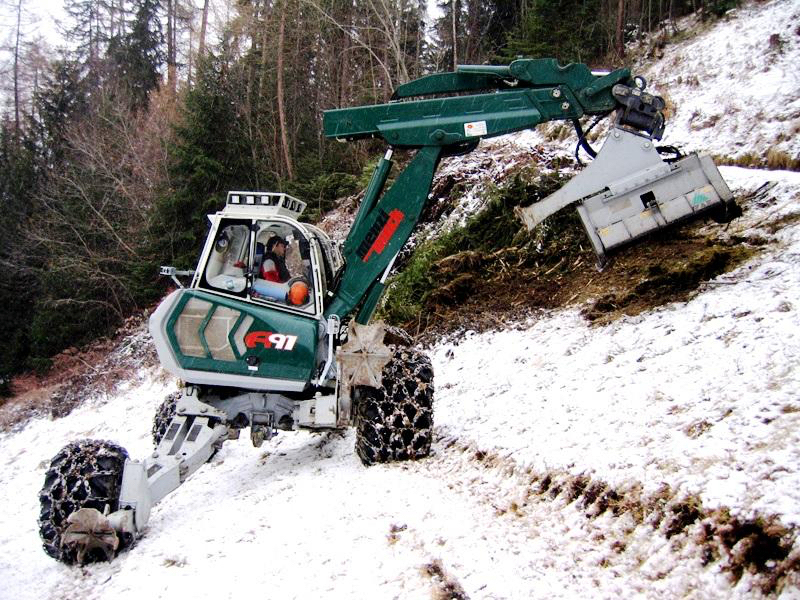 During winter operations or prolonged forestry work, the machine is equipped with very aggressive forestry chains. 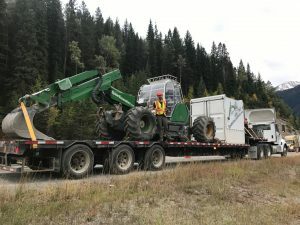 When not working, the machine and attachments are permanently loaded on a tri-axle, 53’ step deck trailer. Also, a 10×8’ shipping container outfitted with a mechanical shop and spare parts storage is always with the machine. 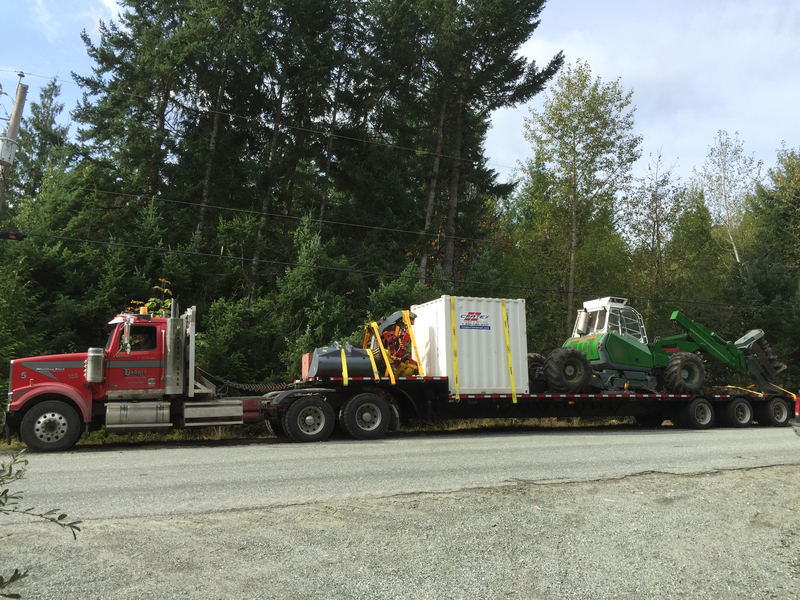 The rig can be moved quickly by any third-party trucking company anywhere, anytime. The Menzi Muck is an extremely versatile and powerful tool and that can even work in water up to 1.7m deep while using biodegradable hydraulic fluid to protect water supply and fish habitat. Small ground disturbance – The large tires, feet, and bucket are the only points that touch the ground. 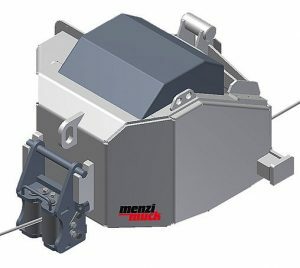 When driving and turning, the Menzi does not damage the forest floors like a tracked machine. Fuel efficient hydraulic system – the hydraulic system reduces fuel consumption and greenhouse gas emissions by providing high pressure at lower engine RPMs. High hydraulic pressure equals maximum performance for the machine and attachments. The Menzi has two fuel tanks enabling the work to go longer between refueling, which is important when working on remote, steep or environmentally sensitive sites. Its telescopic extending boom allows for extra long reach which reduces the need for the machine to move, consequently reducing ground disturbance. Dale provides first class services with extensive experience in extreme mountain environment and challenging projects. 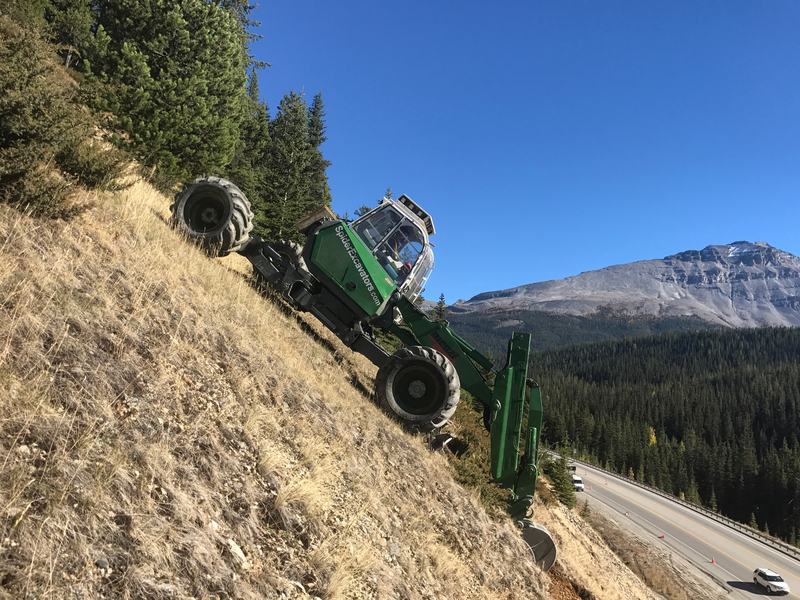 From vegetation management to a wide range of steep slope excavating services, Dale has the experience and technology to provide the sought after complete solution to all your projects. In addition, Dale brings you the know-how expertise based on 25 years experience working in remote locations making the impossible happen! As an entrepreneur in the ski industry for more than 15 years, Isabelle offers a comprehensive background in the development and execution of strategic plans. From construction to safety and marketing. 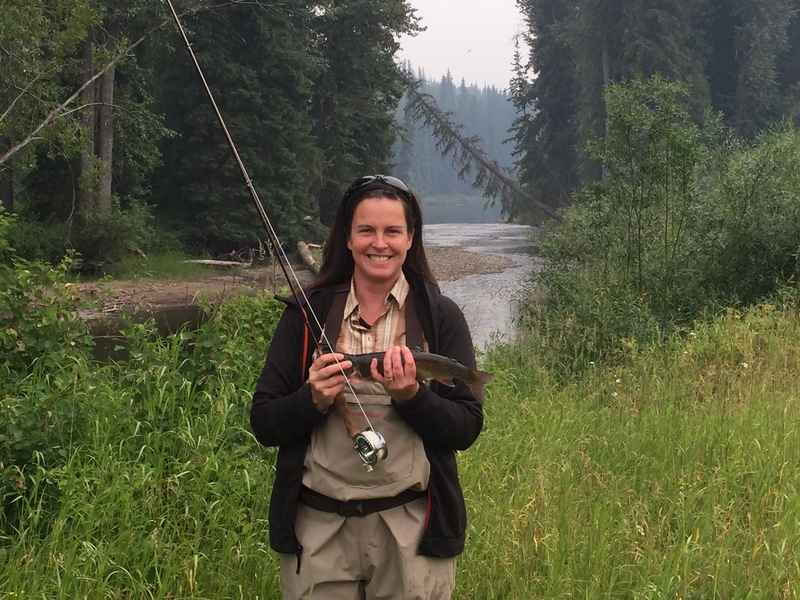 She is passionate about building productive relationships with clients, partners, and employees. 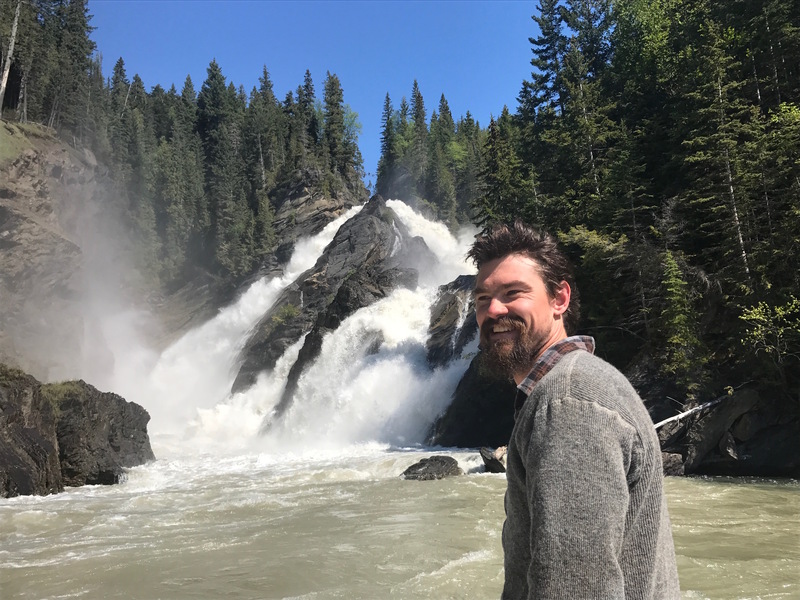 A love of the mountains and a passion for the backcountry brought Dan back to British Columbia following a career in the oil and gas industry. 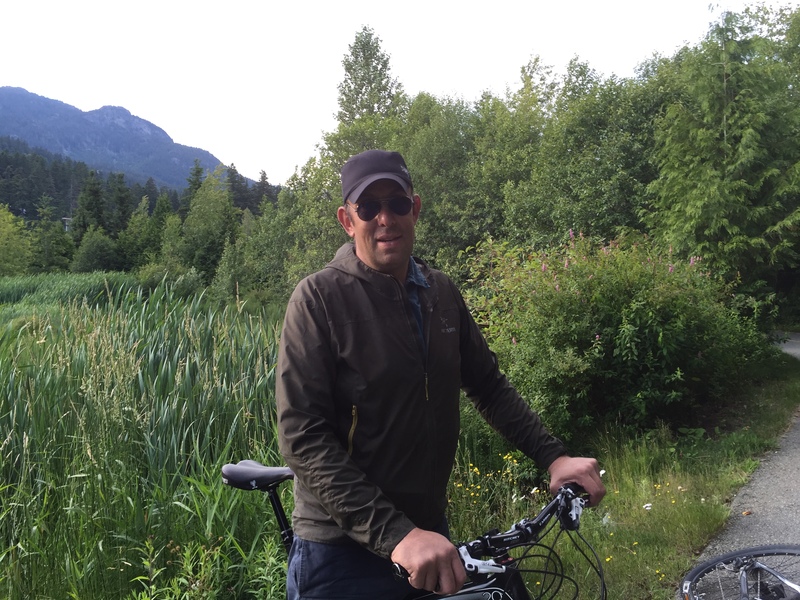 Carving a lifestyle out of working in the BC outdoors, Dan found himself working in forestry, wildfire and on geotechnical sites. Lifelong experience with all things mechanical, Dan rounds out the crew at Spider Excavators. Zeke| Chatter Creek Mt Lodges.